One of the best parts of being a parent is watching your child grow and develop an original personality. All children are different- even siblings can be polar opposites! They can have varying physical looks and interests, and socially, they can also have different approaches to comfortability. Here are some tips to raising an introverted child who is happy and healthy. Introverts are often mislabeled for being shy or even depressed! 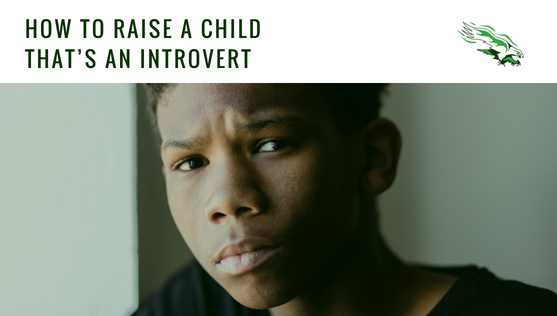 Understanding the behavior of an introvert will allow you to better prepare yourself to parent your introverted child. Introverted children often exhibit the following characteristics. Although studies vary, introverts make up a large percentage of our population. Many famous people have been known to be introverts such as Bill Gates, Emma Watson, J.K. Rowling, Abraham Lincoln, and Mother Teresa. It’s crucial to first understand that your introverted child is not a minority within the social personalities present in our society today- it’s actually pretty common! It’s imperative for your child to know that it’s normal and that he or she is not alone. Introduce your child to new people, social situations and experiences slowly. Introverts often feel overwhelmed and anxious in new environments and around new people. Don’t expect your introverted child to jump in the conversation right away or immediately start participating in a group activity. Arrive early to give your child time to get comfortable before others arrive. By the time others are there, your child will feel like it’s their space that other people are entering. If you aren’t able to arrive early, don’t push your child to immediately interact with others upon arrival. When you and your introvert arrive to a party or social gathering, allow your child to stand back and watch the people and the environment from a distance (perhaps near you where they feel safe). The moments that your child has to observe will give them time to process and adjust. Sometimes even a few minutes is enough to feel more integrated! Take time before an event, game or gathering to discuss the particulars. Discuss the details with your child like who will be there, what will happen, how he or she might feel and what the conversation might look like. The more details that you can talk about, the more comfortable your child will feel as the situation won’t seem so new or as scary because they already know what to expect. The more information that your child has, the less anxious he or she will feel. If your child is nervous about the first day of school, visit the school before it’s time to go back. Go to their classroom, find the restroom, lunchroom and lockers and introduce your child to their teacher and other staff if it’s possible. This practice run will make the first day seem like the second day. A teacher might misinterpret your child’s introverted behavior. A teacher could believe that your child isn’t speaking up because they aren’t interested or that it’s due to a lack of attention- but that’s not the case, your child is just introverted. Introverted children actually tend to be very attentive, but prefer to listen and observe, rather than participate. When your child’s teacher is equipped with the right information and better understands your child’s learning style, he or she can help your child navigate the classroom and be helpful when it comes to activities such as group work or class presentations. Introverts can feel drained from socializing. Remind your child that they can take breaks from socializing if they feel tired or overwhelmed. Let them separate from the social situation by going to a quieter part of the room or even going to the restroom. Develop a strategy with your child about how to sneak away and re-enter the situation without much notice. If you have a younger introvert, you might have to watch for signs of social fatigue, as he or she may not be ready to recognize it. Your introvert needs time to reboot. Recognize when your child has had enough and give them space to relax and recharge. Space can be physical or mental. Allow your child to go to his or her bedroom to read a book in solitude with the door shut or let your child put in their headphones (for a reasonable amount of time, of course!) to drown out the chaos of the household. If your child is too young to notice when they need some space, try to recognize when they’ve had enough. If you know that it’s been a busy week, skip brunch on Sunday or an evening neighborhood activity, and let your child relax. Try to limit the length of time that you’re out and about and build in down time between events and activities. Don’t put your child in a bubble but try to listen to their needs. If you see your child going out of their comfort zone, tell them later how proud you are of how he or she handled the situation. Positive reinforcement makes it easier for your child the next time they are in a similar situation. Casually point out that they enjoyed an activity that they were initially afraid of or nervous about, as this builds up their confidence. Encourage your child to try new things and explore- there’s a fine line between respecting their introversion and encouraging the uncomfortable. Embrace your child’s natural temperament and encourage the interests that your introvert has such as activities that are more isolated or involve few other children. Your child may have varying interests that aren’t team sports and that’s just fine. Exposing your child to activities that they are truly excited about can help them make friends as they might find children with alike interests and a similar temperament. A “bridge friend” can help your child integrate into social situations so it’s not so scary. Having a friend or sibling with your child can act as a security blanket to make your child feel comfortable earlier than they would naturally. A child may show signs of introversion as early as age 3 and their personality will continue to evolve over his or her lifetime. It’s important to note that introverted children are not less social; their approach is just different than that of extroverts. Siblings can possess varying personalities as well, so your older child might be an extrovert while your younger one expresses more introversion. Pay attention to your child’s demeanor, respect their limits and encourage your child to experience the uncomfortable every once in a while.